Cabbage is the vegetable available throughout the year but its good and considered seasonal preferably in winter in Pakistan. Cabbage is the simple and delicious ever vegetable to cook, its cooked around the globe with personal versions and liking with chicken, shrimps, fish, lamb or many other thing like ginger, peanuts, sesame, lime or cream. I like it with chicken during cold winters because it provides quite good amount of water content to body when we normally drink little in winters, I know its not that big reason to cook it but the taste is worth of the reason and liking. 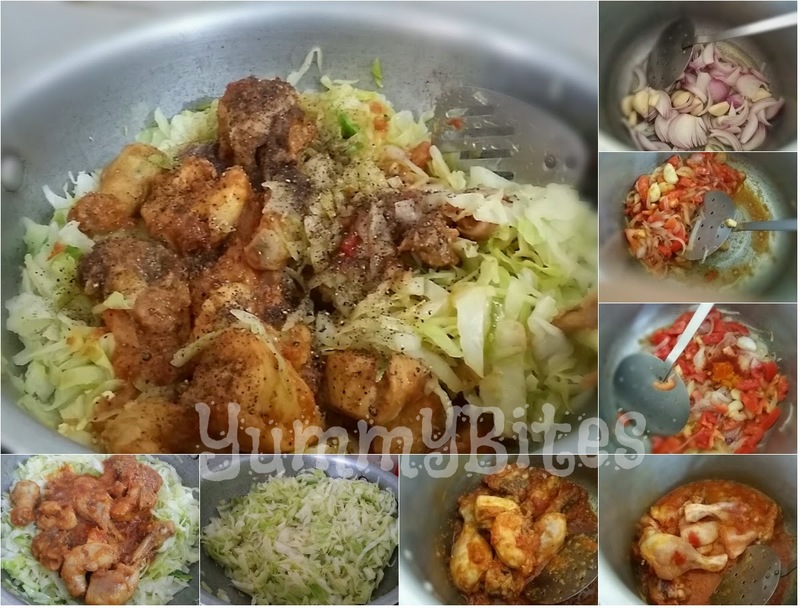 The recipe I follow doesn't belong to any specific cuisine because its a recipe, I learned from my mother and she from her, the recipe is running in our family from generations, many of my aunts cook this easy simple cabbage chicken, they too have their own little difference in spices but the method is almost same. You just have to cook chicken with tomatoes and a little onion to make a chicken based gravy and then braised the cabbage with it. I've made it twice in current winter month and my family loves it. I simply cook cabbage with chicken but you can also grate a carrot in with the cabbage for color,or snip green onions diagonally with a pair of scissors over the top when it's done for a little fresh burst of flavor. But even plain it's a good dish that tastes appealing. I like to use fresh garlic and ginger in my cooking, but for people who don't normally stock those items in their pantry, the dried spices are quite respectable. I like to serve this tasty soft vegetable with crispy lacha paratha which goes well with curries. 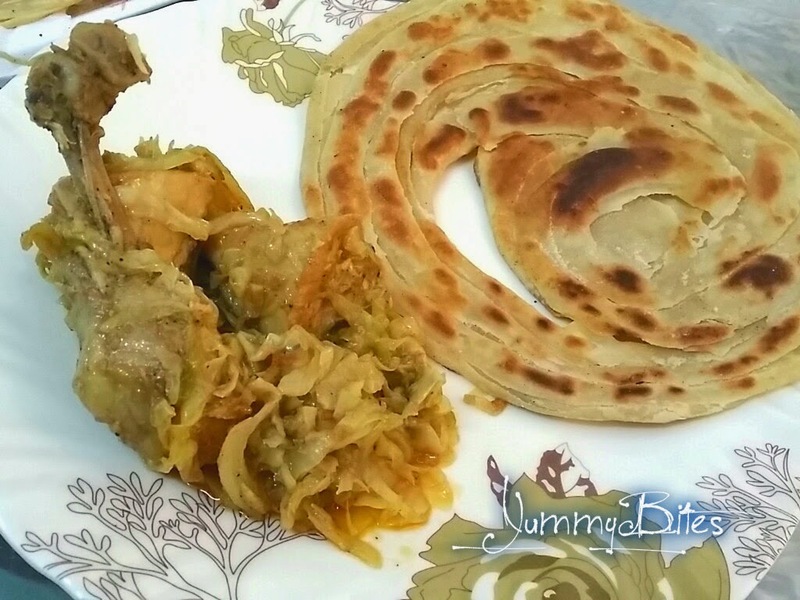 I'll upload Lacha Paratha recipe soon. 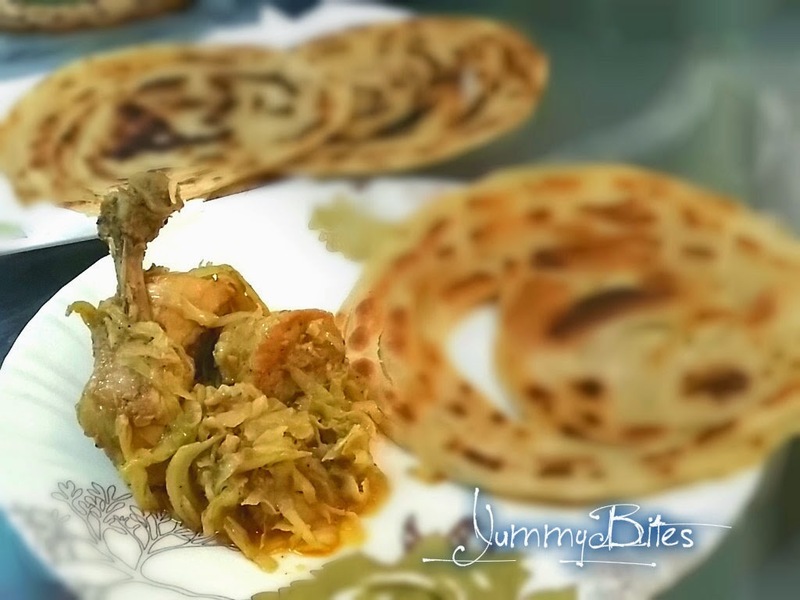 You can serve it as side dish, main dish with boiled rice, roti, chappti, paratha or naan. In pressure cooker or any heavy base skillet heat 3 tbsp oil and fry onions, when onion are slightly golden add garlic clove and tomatoes, salt, turmeric powder and chili powder and add half cup of water and let it cook in pressure for 2 minutes on whistle. Or, in case of braising method fry the mixture stir constantly till tomatoes are soft and tender. After 2 minutes turn the heat off, open the lid and cook the mixture and add chicken pieces and garlic paste and cook throughly to coat the chicken pieces with sauce. Stir constantly for 5 minutes. Add a cup of water and let it cook in pressure again for 5 minute on whistle this time. After 5 minutes turn off the heat and remove the lid and cook till the oil appear at the side. Or, in case of braising method, let the chicken braise on low heat and covered lid for 15 minutes, check and stir throughly time to time till the oil appear at the side and chicken is tender. In a separate skillet heat remaining 2 tbsp of oil or if you are cooking with braising process then remove the chicken in bowl and set aside. Heat oil in the same skillet. 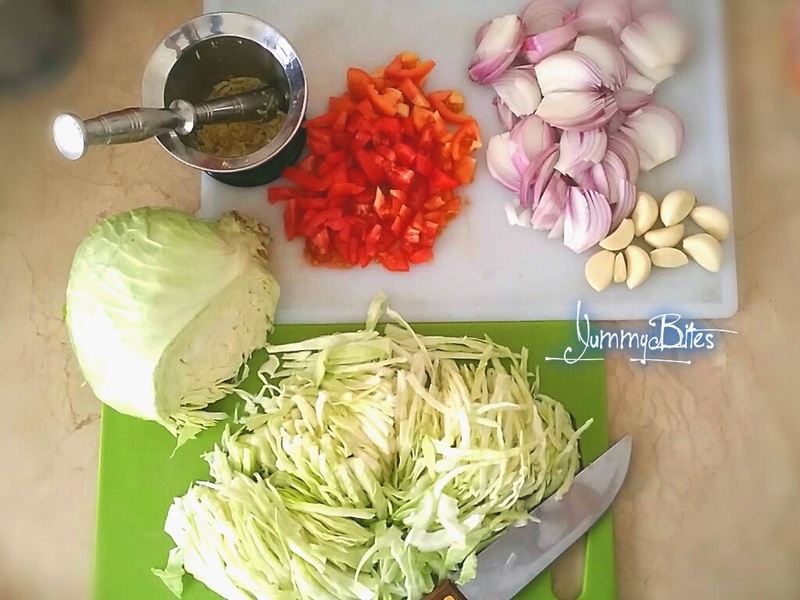 Stir fry the cabbage, when cabbage become soft and crinkled add the previously cooked chicken with all its sauce. cabbage has high water content which is released when it is heated, moreover the moister provided by the chicken gravy is enough for it to cook. Mix the cabbage throughly and cook for minutes on medium to high flame. Add garam masala at the end and cover with the lid to let the cabbage absorb the aroma of masala. Serve hot with chappati or paratha.